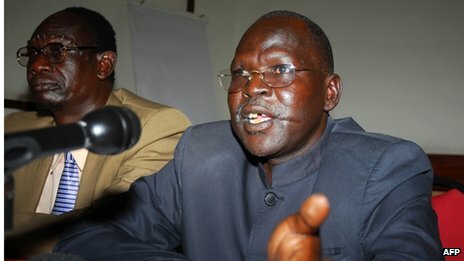 The government of newly-independent South Sudan says prominent rebel leader George Athor has been killed. Vice-President Riek Machar said Mr Athor was killed in a clash with a border patrol after crossing back in to South Sudan for a recruitment drive. The former general launched a rebellion in April 2010. Hundreds have died over the past year as his men clashed with the South Sudanese army. Correspondents say the revolt has been a significant security threat to the country, which became independent in July. Mr Athor took up arms prior to the referendum on independence, after failing to win the governorship of Jonglei state. The south accused him of being used by the north to stir up trouble and derail the vote – charges denied at the time by northern officials. He signed a ceasefire with the authorities in Juba in January, but fighting broke out again within weeks. The BBC’s James Copnall in Khartoum says the area where Mr Athor was apparently killed, Morobo County in Equatoria state, is a long way from his usual operational territory. The vice-president’s office claimed the rebel leader had been in Rwanda, and had returned to South Sudan by land to recruit more soldiers. Mr Machar called on Mr Athor’s followers to lay down their arms and join “the process of peace and development”. A spokesman for Mr Athor’s rebel group told the BBC he had spoken to his leader on Monday, but had not been able to reach him since then. He said it was possible Mr Athor had been in Rwanda for medical treatment, but he had no idea if he had been killed, or what he could have been doing in the area in which he reportedly lost his life.